Story Blurb: When Matt films a documentary of gay men living in New Orleans over the last fifty years, his first subject is none other than Sebastian LaGrange, his very own landlord. The elderly gentleman has lived through good times and bad, has seen and done it all, and Matt thinks he’s perfect for the project. Although Sebastian is initially reluctant, he comes to believe in the project, and opens up his life like never before, telling his story from the first time he kissed a boy, to the present. 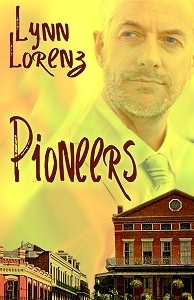 There are a whole bunch of good things that can be said about “Pioneers” by Lynn Lorenz [Amber Quill Press, 2010]. To begin, it is superbly written. The syntax flows flawlessly, the characters are well developed, and the pace keeps the story moving along at a comfortable pace. All important pluses in my opinion. I also found the era in which the story is set—i.e. the 1940s & 50s—a wonderfully nostalgic bonus. As the chief supporting character, Sebastian, says: “It was the fifties, lamb chop. One didn’t come out of the closet, one tiptoed out.” And, later, Matt observes: “That’s what I want to show with this film, baby. I want the young gay men of today to understand what the older gays lived through, how they survived. Or didn’t.” Having come out during the same era, I can readily identify with both of these sentiments. Another appealing aspect is that the story deals with romance between older men; a somewhat unique topic for most writers of male-on-male fiction. In fact, the only other series that comes to mind is Ronald L. Donaghe’s Common Threads in the Life Series. I do have a few minor quibbles, though. Although I understand the author’s intention to add dimensional depth to the characters, I found the switching of voices and times to be a little distracting. I also found the flashback scenes between Sebastian and his dead lover Frank, although a relevant to discuss the onset of AIDS in the 1970s, just a bit too lengthy and even saccharin at times. I hasten to add, however, that these few, minor quibbles do not substantially detract from an insightful and altogether touching story. Enthusiastically recommended. Four and on-half stars. Be an alpha reader: Read an excerpt from my in-progress novel, The Brit, Kid Cupid, and Petunia, an M/M light comedy and adventure tale, and add your comments at the bottom of this page, or email them to me at: gerryb@gerryburniebooks.com. We’re growing! Gerry B’s Book Reviews has reached another threshold of readership. As of this week we passed the 8,000 mark from a year ago, and nearly 1,200 more than last month. Thanks folks!